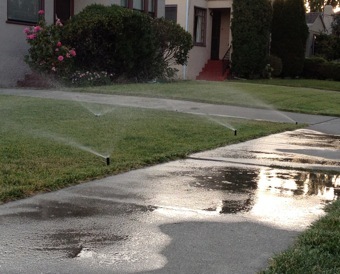 Californians may want to rethink the long-established tradition of watering the sidewalk. You installed a low-flow toilet. You take fast showers. Your yard is water-wise and drought-tolerant. And even if everyone in California were just like you, which they’re not — yet — the state would still see a significant bump in urban water demand by the end of the century. The culprit: warmer temperatures caused by climate change. An innovative new model developed by researchers at Oakland’s Pacific Institute shows that even if California meets its current goal of reducing per-capita water usage 20 percent by 2020 — and continues to improve water efficiency at a similar rate through the end of the century — still, by 2100 the state’s urban water demand will increase by eight percent, or roughly one million acre-feet (with all other factors held constant). That’s a lot of water: enough to satisfy the current household needs of 6.7 million Californians. It’s also worth noting that at a certain point — around 2080, Christian-Smith projects — the residential efficiency measures that Californians have been slowly adopting since the 1980s will cease being quite as effective. By the end of this century, if we stay on track, enough homes will have low-flow toilets, shower heads, faucets, washing machines, and dishwashers that their benefit will become less pronounced. At that point (what you might call the “saturation point”), we’ll really need to focus on reducing outdoor water use through low-water landscapes and widespread use of reclaimed water. The Pacific Institute’s new model isn’t just designed to offer another spin on global-warming doom and gloom — or to pooh-pooh your new toilet. Rather, it’s designed to offer a useful tool to water agencies hoping to plan for the future. It’s particularly targeted toward cities and local agencies that lack the ability to develop their own models, Christian-Smith said. “This tool will allow smaller agencies that don’t have any modeling staff to run some scenarios and potentially include those in their water management plan,” she noted. It’s even available for free to armchair hydrologists. You can download it and an accompanying report, which explains how the model was created and examines a series of six state-level scenarios, at the Pacific Institute’s website. [Redmond] Temperature in the West began to increase, I’ve looked at it over the last 120 years or so, began to increase around the mid ’70s, it’s risen by about 2 degrees Fahrenheit in that time. In the last 10 years or so it’s kind of leveled off and it’s even dropped the last three or four years, we don’t know the reason why. The models predict that this is going to continue to rise by probably another 4 to 6 degrees Fahrenheit during this century. Nighttime temperatures have gone up more than day time temperatures and we don’t know the reason for that. Precipitation really in the western states in general has exhibited no trend that I’m able to see. All the people of California, including all their businesses (including golf courses), only use 20% of our developed water – the other 80% are used by agriculture. Some of that agricultural water use goes to growing our food and fiber – but an ever increasing amount of AG water is used for export crops that don’t benefit anybody else than the grower. If we want to conserve water in the future, we must look into these crops we export, or we’ll all go thirsty and our rivers will turn to mud. Do we need to grow 90% of the world’s almonds in CA? Do we need to grow hay for Japanese ranchers using OUR water? The author states: “….if we stay on track, enough homes will have low-flow toilets, shower heads, faucets, washing machines, and dishwashers that their benefit will become less pronounced. At that point (what you might call the “saturation point”), we’ll really need to focus on reducing outdoor water use through low-water landscapes and widespread use of reclaimed water.” YOU ARE TELLING US THAT ONCE “SATURATION” IS REACHED INDOORS, THEN WE BEGIN ‘FOCUSING’ ON OUTDOOR WATER USE! THAT ABSOLUTELY DOES NOT MAKE SENSE. WE NEED TO BE DOING THAT NOW, NOT AFTER ‘SATURATION’! John Koeller’s point is an important one, so let me clarify what we say in the reports: it is vital that efforts be expanded, immediately, to improve outdoor water efficiency — much of the untapped potential lies in that area. We must not wait (and indeed, much of the cost effective efficiency potential today is in the outdoor landscaping area). But climate changes will have a far bigger effect at increasing demand in outdoor uses, as temperatures rise, than on indoor uses, so such efforts will be even more important in coming years.